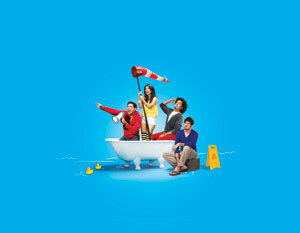 With reality shows becoming norm on every channel, MTV has launched a brand new TV series, MTV Reality Stars. The theme is that everyone knows and sees reality shows but no one knows the comedy and chaos of what goes on behind the scenes. So from the makers of reality shows like Roadies and Splitvilla, comes a series which apart from other things takes a healthy dig at MTV and the madness that goes into creating these block buster reality shows. MTV Reality Stars will premiere on March 16, 2013. Reality Stars is a 12 episode, 22-minute comedy TV series based on the lives of four crazy friends – Krish, Kuldeep, Zameer and Tania, who get caught in the world of reality television. The campaign for the show will see 360 degree marketing promotion through various media verticals, including on-air promotions, digital activations, and on ground activities. The campaign will also see a contest run across 200 plus colleges in the country where selected students will get a chance to be a part of the new show.